On May 22, 2014 four SWAT youth from Okeechobee High School, and the Tobacco Prevention Specialist for Okeechobee County, participated in the Okeechobee County DARE Graduation. The DARE Graduation was coordinated by the Okeechobee County Sheriff’s Office school resource officers, and the attendees of this event included all of the 5th graders in Okeechobee County that completed the DARE training. 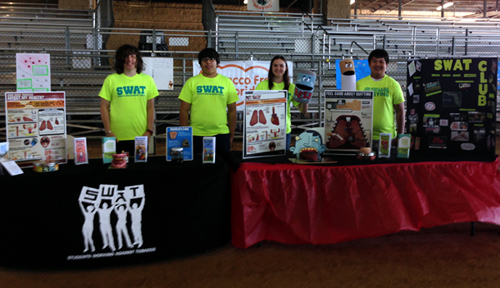 Because the local Tobacco Prevention Specialist has a strong relationship with the Sheriff’s Department, they decided to allow our SWAT club to have a booth at the graduation. The SWAT youth educated the attendees on what the SWAT club stands for, some events that the SWAT club participates in, and how to join the club next year when they are promoted to the middle school. 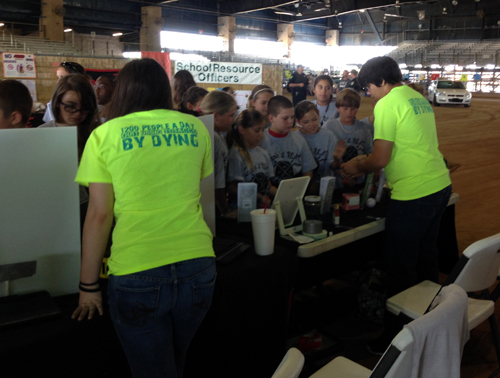 At the event the SWAT youth sat up two tables with displays about how tobacco is harmful to your health, such as Mr. Gross Mouth, Mr. Hairy Tongue, and a Tar Jar. They also had several brochures available for the youth to take with them such as: How Tobacco Hurts Your Looks, Keep Tobacco Out of the Hands of Young People, Pressure to Smoke; SWAT Club and Quit Smoking Today brochures were also available for them to take to family or friends that are interested in quitting tobacco. The SWAT youth had a 3 fold presentation poster that they created about their SWAT Club, which showed pictures from all the different events that the SWAT club has participated during this school year, including Kick Butts Day, The Great American Smoke Out, Through with Chew Week, The Health and Safety Expo, and the Christmas Parade. The SWAT youth also educated the students on the “Thank You Project” that they are planning for CVS, to thank them for stopping the sale of tobacco products, and asked each student to sign their names to one of the “Thank You CVS” posters that were made by the club. After each student signed their name on the poster the SWAT youth gave them a SWAT stress ball or a SWAT pen and thanked them for their participation. There were over 600 students, 50 parents and teachers, the Sherriff and Undersheriff of Okeechobee, and the Superintendent of Schools visited our booth and were educated by the SWAT youth of Okeechobee High School.